Sheldon Alan Richardson (born November 29, 1990) is an American football defensive end for the New York Jets of the National Football League (NFL). He played college football at Missouri, and was drafted by the Jets in the first round of the 2013 NFL Draft. Richardson was born in St. Louis, Missouri on November 29, 1990, the son to Michael and Zelda (née Robinson) Richardson. He attended Gateway Institute of Technology High School in St. Louis, where he played for the Gateway Jaguars high school football team. He recorded 88 tackles and 19 quarterback sacks, while adding seven fumble recoveries, five forced fumbles, and one interception. He also scored six defensive touchdowns on the year, as well, while adding 27 receptions for 541 yards and eight touchdowns at the tight end position. Richardson also lettered in baseball, basketball and track at Gateway. Following his senior season, USA Today recognized Richardson as a high school All-American. He was considered the No. 1 defensive tackle, and No. 4 best player overall, in the nation by recruit rating service Rivals.com. "2009 Missouri Football Recruiting Commits". Scout.com. Richardson attended the College of the Sequoias in Visalia, California for two years. After his sophomore year, he transferred to the University of Missouri, where he played for coach Gary Pinkel's Missouri Tigers football team in 2011 and 2012. He announced on November 30, 2012 that he would enter the NFL Draft instead of finishing his senior year as a Missouri Tiger. He finished the season tied for second on the team with 75 tackles, a figure that led all defensive tackles in the Southeastern Conference. He also had 10.5 tackles for loss, four quarterback sacks, seven quarterback hurries, and three forced fumbles. He was No. 16 on ESPN analyst Mel Kiper's "big board" and generally was projected as a middle first-rounder by several early mock drafts. He was drafted in the first round, with the 13th overall pick, of the 2013 NFL Draft by the New York Jets. He was the first defensive tackle off the board. On July 25, 2013, Richardson signed a four-year $10.05 million deal. He was named the starting defensive end in the 2013 season. During the month of November, Richardson won the NFL Rookie of the Month award, becoming the first Jets player to do so since Mark Sanchez in 2009. The Jets used Richardson as a fullback in six plays during the 2013 season in games against the Atlanta Falcons, the Buffalo Bills, the Carolina Panthers, and the Miami Dolphins. In a week 15 game against the Panthers, Richardson became the first NFL defensive lineman to score a rushing touchdown since B.J. Raji did so for the Green Bay Packers in 2011. He ran for his second career touchdown of the season in the Jets' week 17 finale against Miami. Richardson played 16 games (started 15) in 2013 making 78 tackles, a pass defended, a forced fumble, 3.5 sacks, and 2 rushing touchdowns. 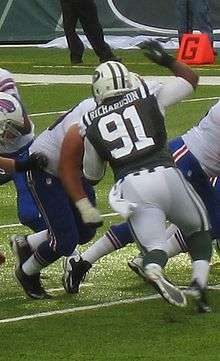 On February 2, 2014, it was announced that Richardson had won the 2013 NFL Defensive Rookie of the Year award, edging out Buffalo Bills linebacker Kiko Alonso by a margin of 23 votes to 19. On September 20, 2014, Richardson was fined $8,268 for his role in an endzone fracas during Week 2 against the Green Bay Packers. During the 2014 year, Richardson started all 16 games making 66 tackles, 8 sacks, 1 pass defended, 1 forced fumble, and 1 safety enforced. For his efforts, he was a Pro Bowl selection for the first time of his career. On July 2, 2015, Richardson was suspended for the first four games of the 2015 regular season due to failing the league's substance abuse policy related to marijuana. He was activated by the team on October 12, 2015. Playing 11 games in 2015, Richardson finished the year with 35 tackles, 5 sacks, 2 passes defended, and 2 forced fumbles. On April 18, 2016, the Jets picked up Richardson's contract option for a fifth year worth $8 million. On June 30, he was suspended one game for violating the off-the-field personal conduct policy regarding his arrest the previous year. On July 14, 2015, less than two weeks after receiving his suspension for failing the league's substance abuse policy, Richardson was arrested in St. Charles County, Missouri and charged with resisting arrest and traffic violations. He was reportedly street racing in excess of 140 miles per hour before attempting to evade the authorities pursuing him. Two other men and a 12-year-old were found to be in the car, all of whom smelled of marijuana. A loaded handgun was found beneath the driver's seat. He was not charged with any drug charges or child endangerment since according to the prosecutor, there was not enough evidence for a case that was beyond a reasonable doubt. There was no gun charge since guns are legal in Missouri and Richardson was in proper possession of it. On January 26, 2016, he was found guilty of reckless driving and resisting arrest. He was fined $1,050, received 2 years of probation, and was ordered to undergo 100 hours of community service. ↑ "Sheldon Richardson Bio". MUTigers.com. Retrieved September 30, 2013. ↑ "MU's Richardson to enter NFL draft". St. Louis Post-Dispatch. December 1, 2012. Retrieved December 31, 2012. ↑ Lehman, Johnathan (July 2, 2015). "Jets' Sheldon Richardson banned 4 games for drugs". New York Post. Retrieved July 2, 2015. ↑ Conway, Tyler. "Sheldon Richardson's Contract Option Reportedly Picked Up by Jets". BleacherReport.com. Bleacher Report. Retrieved April 18, 2016. ↑ Sessler, Marc. "Jets DL Sheldon Richardson suspended one game". NFL. Retrieved June 30, 2016. ↑ Held, Kevin (July 30, 2015). "Local NFL star busted for street racing on I-64". Fox2Now.com. Retrieved July 30, 2015. ↑ Walder, Seth. "Jets DT Sheldon Richardson spared jail for police chase case in Missouri". NYDailyNews.com. New York Daily News. Retrieved January 26, 2016.